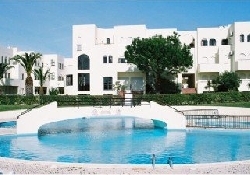 This large newly refurbished modernised CERTIFIED T2 Holiday Apartment LICENCE NO. 9744/2010 is in excellent condition with its balconys and services all on site. This is an extremely large 2 bedroom apartment of a very high standard and specification,as you would expect home form home. Some of its many facilities are eg. 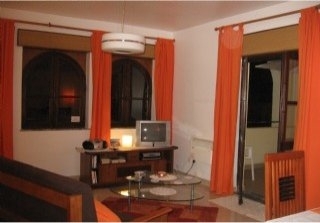 [Fully air-conditioned throughout, sky tv, telephone and broadband internet access which is free to our clients] A 5 min. walk to the beautiful village with its many Restaurants, Bars and Shops. 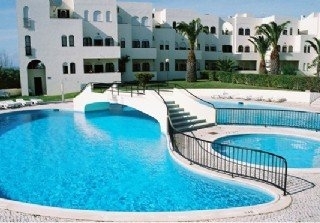 The beach is close by, along with the many Golf Clubs namely [Alto Golf Club}. This area is known for its excellent sea food which makes this fishing village famous. You can wander around the cobbled stoned streets which still retains its old character, charm and friendly atmosphere. The apartment has two bedrooms, a double and a twin. There is a fully fitted kitchen with cooker, fridge/freezer, microwave, dishwasher and washing machine. There is also a toaster, iron and ironing board and hairdryer. In the living room there is a double sofa bed, sky satalite tv dvd and cd player. There is a dining table which sits 6 persons. 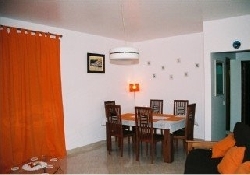 The apartment is fully equipped with air-conditioning/central heating. 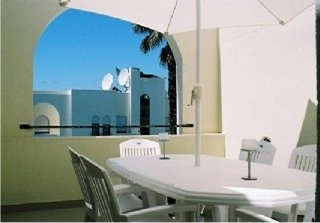 On the balcony there are dining facilities and 1 sun lounger and it overlooks the gardens with its beautiful palm tree. 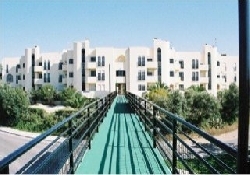 This complex has many facilities incuding : 24hr Reception, Restaurant/Snack Bar, Bar, TV Room, Supermarket], Tennis Courts, Supervised Swimming Pools, Children's Play Area and Private Security. 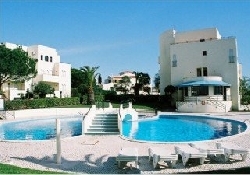 It also has a Laundry Service Bus to the beach, Excursions and Car Hire. The club alvor ferias complex has its own magnificent atmosphere created by a very friendly staff and above all offers so much choice. The complex is divided in two and is connected by foodbridge. 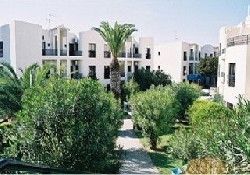 Our property is ideally located on the second floor overlooking a small garden with a lovely palm tree. 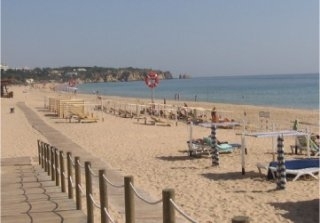 A nice quiet location of club alvor ferias which is perfect for families. if required, contact owner for details. Fly to Faro from Dublin and Cork and Ryan Air fly to Faro from Belfast, Leeds and Bournemouth. British Airways fly to Faro from London Gatwick, Edinburgh, Glasgow, Manchester, Newcastle upon Tyne, Aberdeen and Belfast. Easy Jet fly to Faro from Bristol, East Midlands, Glasgow, Liverpool London Luton/Stanstead and Newcastle. Rates are very competitive especially when booked well in advance. When you arrive, your apartment is clean with fresh towels and bed lined. While you are there you will have a change of towels and a mini clean mid-week. If you are staying for two weeks a repeat full clean and mini clean will take place. Full maid service. N.B. Off season rentals from November to the end of March are plus services. e.g. Maid service, Electicty and water charges and meet and greet service. Please contact owner for further details. A laundry service is close by ideal for the likes of bed linen and towels. These services are exceptionally well priced. Off season rental prices are for long term lets. eg. 1,2,3,4 & 5 months rental periods only. Short term 1 & 2 week rental price on application, long term off season rental prices do not apply. For further details again contact owner. Cancellation Policy: Through your arrival date we will refund 50% of your deposited funds unless we can rent out the apartment for approximately the same time period. 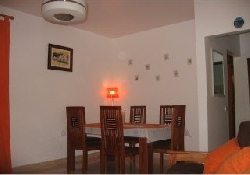 If we can rent the apartment for roughly the equivalent dates, we will refund all but 200 Euro. Refundable Security/Damage Deposit; A refundable/security deposit of E200 is required. This will be returned to you within two weeks of your departure subject to a full and thorough report from our property manager. We will make every effort to be timely and prompt. Arrival and Departure Times: Check-in time is after 4pm and check out time is 10am to allow for cleaning.